A Muslim man beaten by a mob that accused him of transporting cows for slaughter has died in western India, police said Wednesday, in the latest violence by Hindu vigilante groups enraged over treatment of the animal they consider sacred. Pehlu Khan died late Tuesday of injuries sustained when he and 14 other men were brutally beaten three days earlier in Rajasthan state, police said. Hindus, who form 80 percent of India's 1.3 billion population, consider cows to be sacred and for many eating beef is taboo. In many Indian states, the slaughtering of cows and selling of beef is either restricted or banned. The men had bought the dairy cows at a cattle fair and were taking them home in neighboring Haryana state when the mob stopped the trucks, pulled out the men and beat them, said the duty officer at the police control room in Behror town, where Saturday's attack took place. Behror is about 155 kilometers (95 miles) southwest of India's capital, New Delhi. Indian television channels broadcast video of the men being beaten with sticks and iron rods. One of the truck drivers, a Hindu, was released by the mob, but was warned not to transport cattle in his truck. No arrests have been made, the police officer said. He spoke on condition of anonymity because he was not authorized to speak to the media. Since Prime Minister Narendra Modi, a Hindu nationalist, took office in 2014, hard-line Hindus have been demanding that India ban beef sales — a key industry for many within India's poor, minority Muslim community. There has also been a sharp rise in the activities of self-styled Hindu cow-protection groups that stop trucks on highways and attack anyone transporting bovine animals. 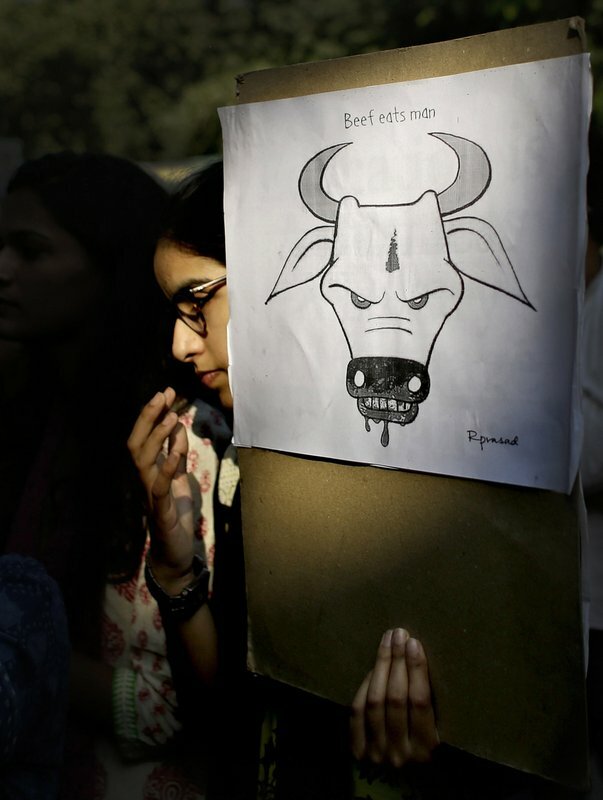 Rumors of beef eating by Muslims have sparked violence in several places in northern India. About two years ago, a man was beaten to death by a mob over rumors his family had eaten beef, and two others were killed for allegedly transporting cows for slaughter.